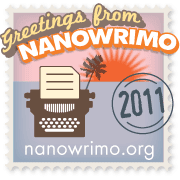 For me, November is National Novel Writing Month and Nanowrimo with its challenge to write a 50,000 word novel in 30 days. I'm an avid reader, always have been. Give me a choice between watching tv and reading a book, I'll take reading any day. And of course, I've always thought it would be great fun to write my own story. So for the past two years, I've put aside both books and tv during the month of November to try and do just that. Frankly, I'm a horrid fiction writer. I get bogged down very quickly in the story, and have yet to make it past the half way point in either of my novels despite reaching the 50,000 word goal by November 30th. But here it is October and I'm gearing up for my third attempt. Why you ask? Good question, I've been asking myself that too. Easiest answer - the only way I have any chance of writing a decent story is to put words to paper and Nano gives me a wonderful, built-in excuse to do so. Also, it's fun - more than I would have expected. Instead of living in someone else's world, with someone else's characters and choices, I get to make my own. Anything can happen when I put pen to paper. (Unfortunately not enough does or I wouldn't end up stuck mid-story). And there's an amazing comraderie to the event - meeting at coffee shops for write-ins and sharing plot snippets and problems interspersed with furious bouts of typing. Since I'd like to give myself the best possible chance of actually finishing my story this year, I signed up for a plot writing workshop by Renda Dodge, author and managing editor of Pink Fish Press. So yesterday a friend and I made the trek up I-5 through the early morning fog to catch the Mukilteo ferry over to Whidbey Island for her last workshop before November. Walking into the room at the Coupeville library, the excitement was palpable. Her workshop offered such a feast of information that I felt like a glutton trying to drink it all in. Now my head is swimming with ideas and plots and plans. 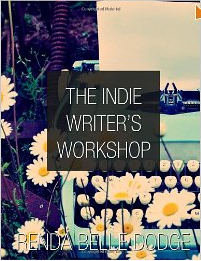 Lucky for me, Renda has published The Indie Writer's Workshop. If you've ever considered writing your own novel, you want this book in your library. Renda has created a fun, comprehensive, easy-to-read and to use wookbook that is going to be my new best friend over the next month and a half. At this point, I doubt I will ever show my fiction to another living soul. But oddly enough, I've found it's a rather effective form of cross-training. Committing to and following through on my first Nanowrimo challenge is what gave me the courage and confidence to tackle my non-fiction book project. It's also how I first discovered CreateSpace (they're one of Nanowrimo's sponsors) and the new world of self-publishing. Next month, I'll once again be going completely outside of my personal creative box for some artistic cross-training of the literary variety. And I invite any of you who are at all interested in trying your hand at writing a novel to join me!